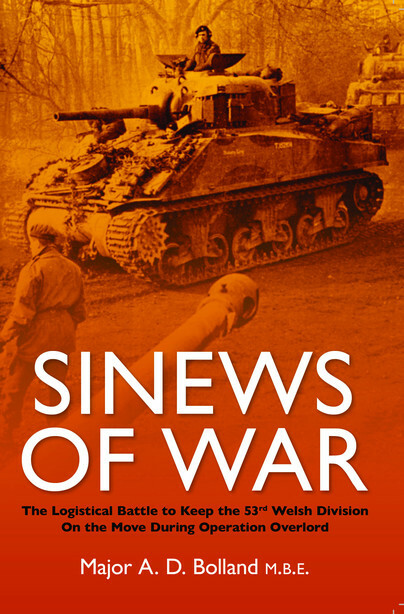 You'll be £9.99 closer to your next £10.00 credit when you purchase The Sinews of War. What's this? A fascinating account of the feat of logistics which it took to supply of the hard fighting 53rd Welsh division from Normandy to Hamburg. A limited run Divisional publication out of print since the ’50s with a new introduction and overview of the actions of the Division. This is a valuable resource for students of the North West Europe campaign. This is a surprising booklet ! Only 98 pages thin, but what an extraordinary account. It is the divisional 'report' of the logistics for the 53rd Welsh Division, on their quest to reach and defeat Germany. They landed in Normandy and wound up all the way north in Hamburg. The nice thing about this book is that it is essentially a report written back in 1946, detailing the logistics support and other activities of the unit in great detail. One often doesn't realize how many people work 'behind the scenes' to keep an army fighting, and this report is a welcome tribute to that work and those people and a great source for data. The sketches illustrating the booklet are very nice too and adding to the sense of reality. Also a great asset are all the map drawings and tables, and of course the interesting photos provided. Essentially a summary of the division's Post Operational Report for operations in 1944, this compact book was originally published in 1946. Originally produced as a record of the Logistic Support that sustained the division it is packed with raw data on every facet of that support, mail, casualties, pay and ammunition expended to name but a few. In guiding terms, this is gold dust for the WW2. This important book is packed with information. The author has provided a rare account of logistics in supporting a combat operation that will be of enormous value to historians and enthusiasts – Highly Recommended. Throughout the book there are a selection of archive photos and plenty of really excellent, atmospheric sketches done by Cpl J.C. Ogle for the book.